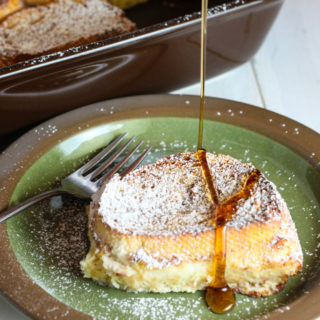 Are you looking for something a little different to throw on the grill? Look no further! 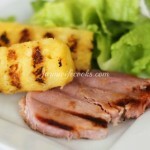 This Grilled Pineapple and Ham Steak recipe will soon be a family favorite! We usually have a freezer full of beef but this year we were able to buy half a pig. 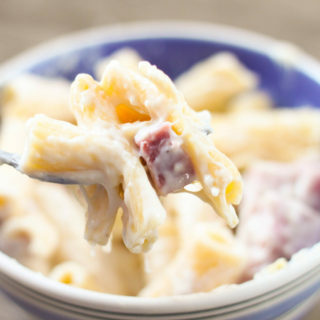 We love to eat ham year round and these ham steaks are the perfect quick and easy meal. 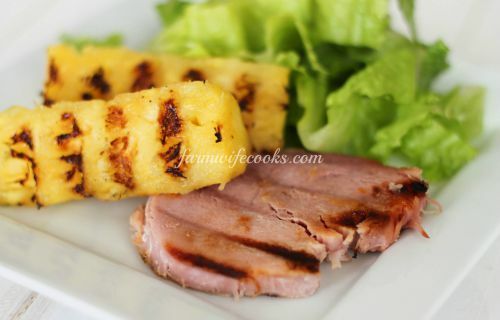 My favorite way to have them is with grilled pineapple, there is just something about the ham and pineapple combination that I love! I love to cook on the grill in the summer and have been known to cook on it through out the year! 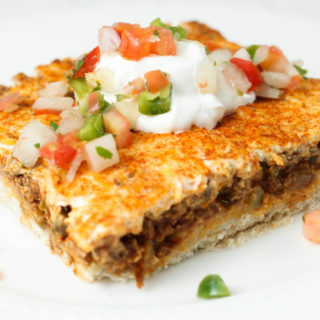 This recipe is a simple one that would work perfect for a busy week night meal or would also be great for a cookout. You start by making the sauce which is equal parts Dijon mustard, honey, pineapple juice and apricot-pineapple preserves. Apricot preserves would work too. Crank up the heat on the grill to a medium flame, about 350-400 degrees should do the trick! Grill the first side of the am for about 4 minutes and then turn over. Brush with the mustard mixture and let cook for another 4 minutes. Turn again and brush with the remainder of the mixture and let cook just a couple minutes more. Grill pineapple on all sides. I had the pineapple on the grill for the same amount of time as the ham. 1 Pineapple cut into spears. Mix the mustard, honey, preserves and juice together in a small bowl, set aside. 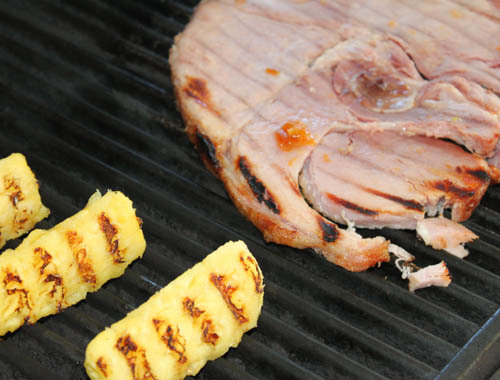 Place the pineapple and ham on the grill. Turn the pineapple every couple minutes until each side is grilled. Grill the ham over medium heat for 4 minutes. Turn the ham and brush with mustard mixture. Grill for another 4 minutes. Turn ham again and brush with mixture. Cook 2-4 more minutes or until heated through.